Moringa tree has been referred to as the ‘Miracle tree’ for its versatility and it is believed to be an ideal plant to combat under-nutrition because of its nutritional benefits and availability. Yes, its True, these tiny little leaves have the potential to save the lives of millions of people on our planet. 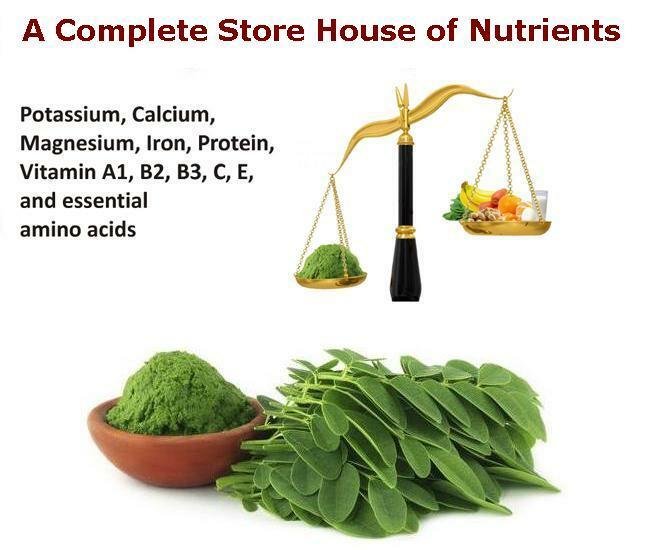 Moringa leaves are a store house of nutrients. It is a multipurpose plant and it’s leaves, pods, fruits, flowers, bark and roots are beneficial in one way or the other. However the most commonly used parts are Moringa leaves and seeds. Let’s see some of the amazing health benefits of Moringa leaves here on this page. The scientific name for this tree is Moringa oleifera. Moringa is a complete super food also called as survival food containing all the nutritional elements we need to survive. It contains 7 times more potassium than bananas, twice the amount of protein compared to milk, 4 times calcium contents than milk, 4 times more vitamin A compared to carrots, 7 times more vitamin C than oranges, 25 times more amount of iron compared to spanich, 36 times the amount of magnesium in eggs,50 times mote vitamin B3 than peanuts and 50 times more vitamin B2 than bananas. Records show Moringa is being used in medicine since from 5,000 years ago and in the ancient times, Moringa was known and used in traditional societies around the world. Having Moringa Tree or Plant at home is like growing multi-vitamins at your doorstep. Moringa Leaves have all of them including Vitamin A, Vitamin B1, Vitamin B2, Vitamin B3, Vitamin C, Calcium, Chromium, Copper, Iron, Magnesium, Manganese, Phosphorus, Potassium, Protein and Zinc. Moringa leaves contain all the essential amino acids… …to build strong, healthy bodies. High blood sugar can be a serious health problem. In fact, it is the main characteristic of diabetes. In the traditional medicine, Moringa oil is used in treating snakebites or wounds. It is also used in hair care products and also s machine lubricants. M. oleifera seed extract is used worldwide, especially in rural areas of developing countries, to treat drinking water. Its seeds contain certain compounds which are carbohydrate-binding proteins that are able to reduce water turbidity because of their coagulant activity and reduce the growth of harmful bacteria. Mooring leaves contain almost 30 antioxidants that greatly contribute towards Healthy Skin. Moringa Leaves also contains Sulphur which is responsible for providing protein to the skin cell which provides elasticity, softness, rigidity and strength to our skin. The benefits of moringa plant extracts also include relief from bronchial asthma and inflammation caused in the airways. According to research, treatment with moringa helps to reduce the severity of asthmatic attacks and various symptoms such as wheezing, cough, dyspnea and tightness of the chest. It extends its protective effects against bronchial constrictions and encourages better lung function and respiration. It is an economical and ecologically responsible alternative to traditional crops which are being used as fuel because it can grow on marginal land, and doesn’t require much maintenance, fertilizer or pest control. Use Moringa is a “miracle tree” and most of its parts, including the leaves, bark, fruits and roots are used as food items. Leaves of its tree can be added to salads and are also used in the preparation of sauces and soups. Cold pressed moringa oil is used for cooking and is appreciated for its long shelf life. The immature seed pods of the moringa tree, popularly known as drumsticks in India, are used in various dishes. Ben oil helps in reducing common skin complaints such as acne and blackheads that arise from imbalances in oil secretion by skin glands. They are often worsened by bacterial and fungal infections. Massage the oil on the face and allow it to be absorbed by the skin pores. The light nature of the oil unclogs the pores and lifts up the dirt and debris.